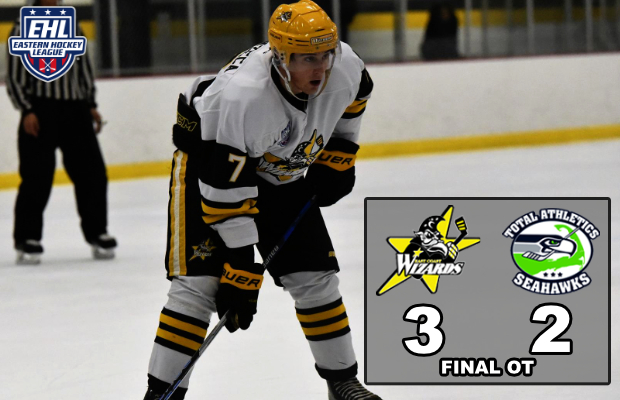 BEDFORD, MA -- The Wizards completed the season sweep of the Total Athletic Seahawks yesterday afternoon, with 3-2 overtime victory in Hyannis. With the win, the Wizards moved to 20-13-0 on the season, and are now just 9 points behind the 2nd place Walpole Express. "It was another great effort from our group," said Wizards head coach and general manager Freddy Meyer. "Their goaltender played very well, and our guys struggled all day to beat him. Kory [Falite] and I were happy to see the boys continue to push, and ultimately get the result that they both wanted and earned." The Wizards fell behind on the scoreboard early on as the Seahawks took a 1-0 lead into the 1st intermission. The boys would get a goal back from their leading scorer, Devin Panacea, just over the halfway point of the 2nd period. Zach Mitchell would later score his first goal of the season to give the Wizards the lead early on in the 3rd period. However, The Seahawks would convert on the power-play with just over 4 minutes left in the contest to knot up the score at 2 goals apiece. The game would head into overtime, where Panzeca was the hero yet again for the Wizards, scoring the game-winning goal just under 2 minutes into the extra frame. The forward has now tallied an impressive 22 goals and 26 assists (48 points) in 26 games for the Wizards this season. Alec Marshall stood tall in net, stopping 20 shots in the winning effort. The Wizards will head on the road this weekend and will look to avenge their early season loss to the Connecticut Roughriders as puck drop is scheduled for 5:30pm on Saturday. The boys will then return home to battle the Valley Jr. Warriors this upcoming Tuesday, before setting out for the final stop of the 2017-18 #EHLShowcaseSeries (January 19th and 20th - West Chester, PA).